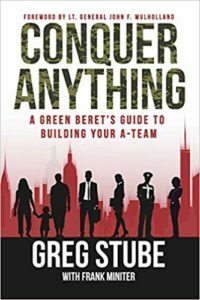 Greg Stube – Special Forces Warrior, Speaker, and Author of Conquer Anything. 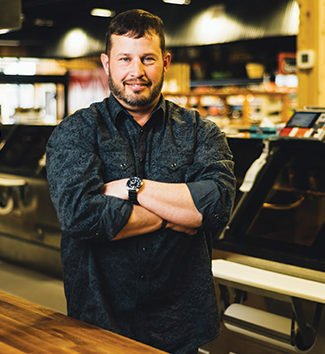 A Combat-wounded veteran, after returning home and receiving extensive medical care, Greg’s inspiring story makes him a sought after speaker inspiring others to achieve their highest possible goals in both their professional and private lives. Training in surgery, anesthesia, trauma management, pharmacology, minor dentistry, veterinary subjects and more. These skills were used to help his “A-Team” function where there is no doctor. Greg is also SERE (Survival, Evasion, Resistance and Escape) qualified, and as a career parachutist, Greg earned the qualification of Jumpmaster earning the Master Parachutist Badge award. During his years of service, Greg participated in the initial development of the Special Forces Advanced Urban Combat training doctrine and the 10th SFG(A) SFAUC course, where his weapons capabilities and shooting abilities remained at the core of Special Forces proficiency and competency throughout a career on the teams. Greg spent the 1990s, with the Special Forces, stationed in hostile fire zones. While serving in Combat Operations in the Global War on Terror, Stube was wounded in Afghanistan during Operation Medusa. Stube’s A-Team encountered overwhelming numbers of Taliban fighters in The Battle of Sperwan Ghar, which lasted over a week. Stube’s wounds from a remotely detonated IED and enemy fire seemed fatal, but instead he survived to endure months of hospitalization and surgeries. Huge wounds to his abdomen, hip and pelvis eventually closed, his nearly severed leg was restored, and extensive full-thickness burns were grafted. On the path to a “miracle” recovery, Greg endured 17 surgeries and an 18 month hospital stay. Greg retired in 2011 after 23 years of dedicated service. After returning home, Greg went on to host his own television show on NBC Sports titled Coming Home with Greg Stube. Because of Greg’s inspiring story of strength and perseverance, and his heartfelt communication style, he’s become a sought after speaker where he often leaves people thinking how they’re going to achieve their highest possible goals in both their professional and private lives. Greg has taken this same inspiring message and co-authored, along with Frank Miniter, a book titled Conquer Anything. Greg is also a consultant and serves as a leadership presenter for the FBI and the FBI National Academy, in DC and Quantico. During his free time, Greg volunteers for various charity work. Share the post "Greg Stube, Author of Conquer Anything"